Targets. Once again, paint several heavy paper plates with your group. Once the paint is dry, they will become fun targets that children can attempt to hit with bean bags or foam balls. Offer different challenge levels by depositing the plates here and there on the floor, at varying distances, or by hanging them on a wall, at different levels. Homemade Twister. Purchase colourful paper plates (blue, yellow, red, and green). Use strong adhesive tape to arrange them on the floor to represent a grid, as in the traditional Twister game. Give children instructions to help them practice their color recognition skills while working on identifying various body parts. For example, you can invite children to place one hand on a red plate and one knee on a blue plate or an elbow on a yellow plate and a heel on a green plate. Emoticons. Purchase a stack of yellow paper plates. 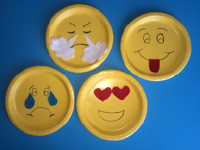 Use a black permanent marker to draw eyes, eyebrows, and a mouth on each plate to represent different emotions (fear, sadness, anger, shyness, etc.). Of course, you may also use other colors to draw a variety of accessories and details (tears, tongue, hearts, etc.). Use your homemade emoticons to explore and identify children's emotions. Steering wheels. For each child, cut out the centre of a paper plate. Keep only the contour and use it to represent a steering wheel. Ask children to color or paint their steering wheel black. Use these cardboard steering wheels to help children differentiate left from right. Simply stand before your group with your back to the children and pretend to turn towards the left and to the right, alternating between both directions. Little ones will have a blast imitating your every move. You can even encourage children to bring their steering wheel with them when you go for walks. They will enjoy "driving" around your neighbourhood, avoiding obstacles, and stopping at street corners. Ready-to-eat meals. Explain how a meal is supposed to contain food items from each of the food groups. 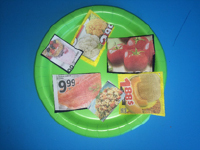 With your group (or before children arrive), cut pictures of different food items out of grocery store flyers. Sort them (milk products, fruits and vegetables, meat and substitutes, grains). Invite children to pick an item from each pile and glue them in the bottom of a paper plate to create a balanced meal. If you prefer, laminate the food items and let children simply deposit them in paper plates. This method will make it possible for them to create a wide range of meals over and over again when they are playing in your kitchen area. Castanets. 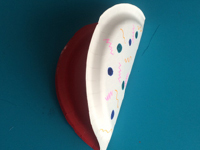 Give each child two small paper plates and let them color or decorate them as they wish. When they are done, help them fold their plates in two and glue tiny bells inside with hot glue. Show children how they can pinch their castanets repeatedly to produce delicate sounds. Cardboard necklaces. Give each child a paper plate. Help them cut out the centre of their plate as well as a slit in the contour. Children will be able to slide their cardboard necklace around their neck. Invite them to color their necklace before gluing foam shapes or beads on it to represent precious stones. Children will proudly wear these unique pieces of jewellery. Cardboard necklaces also make great gifts. Giant wreath. Collect a large number of paper plates. Depending on the season or celebration, use colourful plates or white plates that children can color or paint. For example, for Easter, choose pastel colors. For Valentine's Day, choose pink, red, and purple plates. With your group, overlap the plates to create a very big circle that will become a giant wreath. 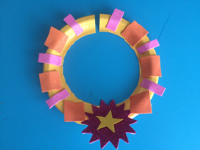 Glue foam shapes or add stickers related to your theme before hanging your wreath to decorate your daycare. This inexpensive decoration represents a great group project. Memory game. Print several word flashcards or pictures from your current theme's picture game, making sure you have two copies of each one. Glue each flashcard or picture in the bottom of a thick paper plate. 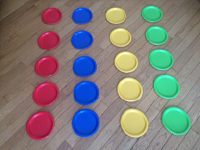 Arrange the plates in rows on the floor, leaving enough room so children can walk between the plates. Children can take turns flipping two plates over. If the pictures are identical, they can keep the plates. If they are different, they must flip them over once again and return them to their original places so the next player can attempt to find matching pictures.